Heat exchangers are ubiquitous in many processes that are present across the oil and gas industry and elsewhere. The concept of heat exchange – reusing heat generated in one process for use in some other area of a facility – is a familiar one that stretches right down to the heaters in our vehicles. Capturing heat for reuse is a very common way of reusing energy found within a process, increasing efficiency and reducing overall costs. But, there are other forms of energy that are often wasted after use – such as the energy generated when fluids are pressurized. A company with a long history of energy reuse in a field that uses plenty of pressurized fluids, the water desalination industry, has turned its technology into options for oil and gas companies to capture and reuse energy from similar fluid flows. Much like heat, pressure is an energy source that can be drawn from in many parts of an operation, according to Energy Recovery CEO Tom Rooney. Energy Recovery has a long history in fluid flow and pressure capture, starting out around 20 years ago to serve a growing number of desalination plants around the globe. In that industry, energy capture and reuse is a mission-critical part of the operation, allowing it to be sustainable long-term. Today, the company’s products are present in 90 percent of the desalination plants operating worldwide, Rooney said, with efficiency levels running as high as 98 percent. When the company considered options for expansion, the oil and gas industry was a natural contender. Midstream operations were the first target market for Energy Recovery’s technology, named IsoBoost for the oil and gas sector. Specifically, the company aimed at sour gas processing operations. In sour gas plants, amines are used to “sweeten” the gas through a process that involves highly pressurized fluids. Most of the time, these plants push the amine fluid into the process once, then release the pressure afterwards. That is a waste of energy that can be recaptured, Rooney said. “We come in and suggest that they put one of our devices into the process, and just like a heat exchanger it grabs the pressure just before it would be thrown away and put it back into the loop,” he said. Central to the IsoBoost system is a liquid phase turbocharger made up of a high-efficiency turbine powering a centrifugal pump, according to the company. The system creates a pressure drop in one liquid process flow while increasing pressure in a second flow. The resultant pressure can be reused, cutting the amount of energy needed to run the process while also providing numerous other benefits, Rooney said. Along with reduced energy, the system improves uptime and reduces plant maintenance significantly, Rooney said. 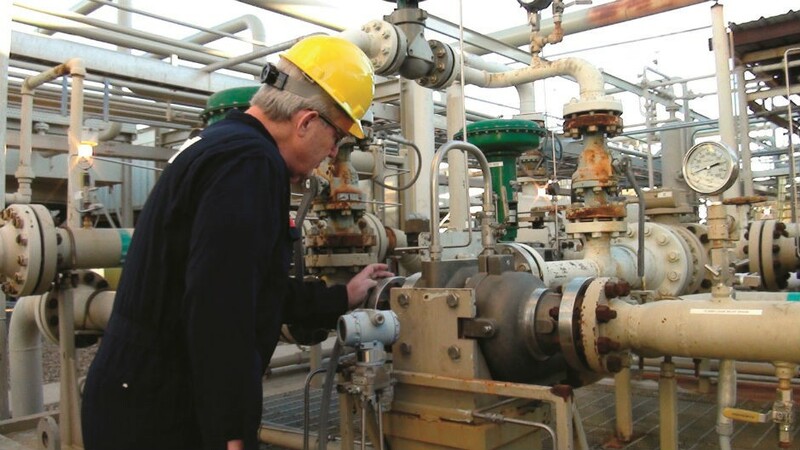 In one south Texas gas processing plant, indications are that the total maintenance bill for the plant has dropped by 60 percent along with a reduced power bill. Adding the IsoBoost system into a plant is relatively easy, Rooney noted. Amine systems were the first step into the oil and gas industry, but Energy Recovery is also hearing from other operators with plenty of fluid flow. Pipeline operators may benefit from the system as well. Where pipelines run downhill for any distance, pressure reducing valves can be replaced and energy harvested for reuse, Rooney noted. Other uses for IsoBoost in the oil and gas sector may include installation on hydrotreaters and in offshore applications involving produced water. The technology has also been adapted to become part of the company’s new VorTeq product for hydraulic fracturing. That product is designed to reduce maintenance and repairs on fracturing operations by keeping grit and fracturing fluid out of high-pressure pumps, channeling abrasive fluids down the well rather than through the pumps. That, according to Energy Recovery, could reduce maintenance costs by up to 50 percent for fracturing service operators.